Stepan went to the dressing room but did return for the 3rd period. So it’s going to come down to the wire with Derek Stepan and the Rangers, as the first-line center had not yet reached a contract agreement as of Sunday evening and his arbitration hearing is set for Monday in Toronto. The Post has learned the 25-year-old restricted free agent is going into the hearing asking for $7.25 million and the club is offering $5.2 million, both on a one-year deal. With the independent arbiter able to pick any value of his choosing — a different process than the “pick-one” used in other sports — that would leave the middle ground of $6.225 million, a seemingly reasonable evaluation. The one-year deal and manageable salary would also make Stepan easy to trade if the Rangers find themselves as sellers come the deadline. The team is pressed up near the $71.4 million ceiling of the salary cap, with 21 players signed and about $7.35 million remaining without Stepan. Stepan's arbitration hearing is schedule for Monday, July 27th. Salary arbitration filings create deadline-driven negotiations, and so there is still time for the Rangers and Derek Stepan to strike a deal prior to Monday’s scheduled hearing, as Chris Kreider, Ryan Callahan and Brandon Dubinsky all did on the mornings of their respective scheduled hearings and as Derick Brassard did on the eve of his last summer. But at this point, with a wide gulf separating the parties, it’s more a question of whether the Blueshirts will decide to go for a one- or two-year arbitration award than whether the club and the 25-year-old center will be able to hammer out a long-term agreement within the next 72 hours. The Rangers, who have the option, must declare by Saturday, when the club and player submissions are due. The decision will rest on management’s evaluation whether Stepan’s trade value would be higher on a hypothetical one- or two-year contract. Stepan is not eligible to become an unrestricted free agent until 2017. Can The New York Rangers Afford Derek Stepan? Initially, it was thought that the Rangers would be able to lock their 25-year-old alternate captain into a long-term deal slightly above $6 million annually. Buffalo giving a comparable center in O’Reilly crazy money raises Stepan’s asking price. Stepan is an upward-trending star who is just breaking into his prime years. He has averaged 0.78 points per game over the past three seasons and has scored his share of memorable playoff goals. The question is: How far do the Rangers go to satisfy Stepan? He is definitely worth between $6 and $6.5 million million per year. Anything above $6.5 million is an overpayment. He’s not worth Nicklas Backstrom or Anze Kopitar money. A demand of a long-term deal above $7 million AAV could force the Rangers to do the unthinkable — trade Stepan away. Finding takers for third-pair defenseman Kevin Klein (three years, $2.9 million AAV) and/or fourth-line winger Tanner Glass (two years, $1.45 million AAV) could help alleviate the cap squeeze. Demoting Glass to the minors would force the Rangers to carry $500,000 in dead cap space, but would free up $950,000 of cap room. It was Christmas in July for Derek Stepan but a lump of coal in Jeff Gorton’s stocking, this gift of Buffalo’s seven-year, $52 million ($7.5 million per) extension to Ryan O’Reilly that kicks in next season and will keep on giving headaches to the Rangers and their newly installed general manager. In a flash, Friday’s agreement between the needy Sabres and the 24-year-old center they obtained from Colorado last weekend blows to smithereens any hope the Blueshirts had of signing the 25-year-old Group II free agent center Stepan to a long-term deal in the range of $6.2 million to $6.5 million per. It likely means Stepan, whose numbers are superior to O’Reilly’s in every meaningful category other than faceoff efficiency, not only will file for salary arbitration by Sunday’s 5 p.m. deadline, but could be in line for a two-year award taking him to unrestricted free agency worth well over $7 million per. With their 2-1 OT win over the Washington Capitals tonight, the Rangers move on and will face the Tampa Bay Lightning in the Eastern Conference Finals. The Rangers have already seen life without Derek Stepan, and it ain’t pretty. They might have to deal with it yet again, as the top-line center left Tuesday’s 3-0 loss to the Islanders at the Garden with what coach Alain Vigneault called an “upper-body injury.” Stepan had received an unpenalized slash on the hand from Islanders forward Matt Martin in the first period, but Vigneault said the extent of the injury won’t be known until Wednesday. Stepan played just three shifts after the first period, the final when he turned the puck over on a second-period power play that resulted in Frans Nielsen’s shorthanded goal. He was not on the bench for the third. Stepan, back on the ice after missing two days due to a foot contusion initially suffered on Sept. 9 (the team did not skate on Tuesday as the Rangers held their annual golf outing) was participating in a full-rink sprint drill. But, shortly after pushing off and trying to get up to speed, Stepan collapsed to the ice on both knees around the far blue line, sliding through the neutral zone before coming to a stop in the opposite zone clutching at the area of his left knee. Stepan could be heard groaning in pain as he was attended to on the ice and then helped off by teammates Mats Zuccarello and Marty St. Louis. Fractured fibula for Derek Stepan. No timetable yet on how long he'll be out. At doctor now. Rangers say update later today. So we had a player returning from jaw surgery and scoring 2 goals in Derek Stepan, a 4-1 New York Rangers lead blown, a pulled goaltender in Henrik Lundqvist, a hat trick for Rene Bourque, a match penalty for John Moore, an empty net for the Rangers with seven minutes left in the game and some near-the-bench shenanigans. Did I miss anything, or did that cover the Montreal Canadiens' 7-4 victory over the New York Rangers? Oh yes, Derek Dorsett head-butting Mike Weaver and then doing his damnedest to injure Rene Bourque on the last shift. And Tomas Plekanec actually being called for fake-jerking his head back to try to draw a penalty. What exactly did Therrien mean, and what message was the coach attempting to send to his players, or anyone else, by stating: “We expect Derick Brassard to play and we know exactly where he’s injured. Hockey is a small world…”? It was an outrageously irresponsible statement from an adult in a position of responsibility — at worst a threat, a threat to re-injure. If anything happens to Brassard now, what else would anyone think? Alain Vigneault says Derek Stepan's jaw was broken by Brandon Prust, and Stepan is undergoing surgery. Prognosis not yet known. Doctors cleared him to play last night. Says diagnosis on Stepan made this am. He requires surgery. No timeline for return. Somehow, Prust escaped without a penalty. Heaven only knows. The winger is not a dirty player, we know that from his time here. He is a hard one, and an honest one, but as the NHL Department of Player Safety reviews the open ice hit on Friday as it must, the people running the show will note that Prust has a playoff history he earned as a Ranger, suspended as he was for one game — Game 4 of the 2012 Eastern finals against the Devils for an elbow to the head of New Jersey defenseman Anton Volchenkov. Stepan, who missed a couple of shifts but returned to the fray after having his head examined, left no doubt after the match he believes the league should enact supplementary discipline against his one-time teammate. “It doesn’t matter [who it was]; it’s a bad hit,” Stepan said after the OT that ended in stunningly quick fashion when a rebound bounced in off Alex Galchenyuk at 1:12. “I certainly hope the league will look at it. “I never saw [Prust]. I got the puck and I moved it. I even got some strides in,” Stepan said. “I never saw him. No penalty on the play and Stepan did leave the game but did return. The stalemate between the Rangers and Derek Stepan appears to be coming to an end, with talks between the club and its presumptive first-line center having accelerated Thursday morning, sources have told The Post. It is believed the parties are zeroing in on a two-year contract worth approximately $6.5 million. That would represent a split-the-difference agreement: Stepan had been seeking $7 million while the Rangers had been offering approximately $6 million. Stepan, who has been skating in Madison with players from the Wisconsin varsity, would likely meet the Blueshirts in New York on Sunday after they return home from Friday night’s final exhibition game in Las Vegas against the Kings. That would leave time for merely a handful of practices for Stepan to get ready for the Rangers’ opener in Phoenix on Oct. 3 as he acclimates himself to new coach Alain Vigneault’s system. New York Rangers general manager Glen Sather appears to be growing impatient with center Derek Stepan. The restricted free agent has yet to sign a contract with the club and has held out of training camp. Stepan, 23, led the Rangers with 44 points (18 goals, 26 assists) in 48 games last season. "I don't think Derek is going to let this thing linger that long," Sather said in an interview on MSG Network during the Rangers' preseason game against the Calgary Flames on Monday night. "I don't think he is a big enough fool to think that he will sit out the year and it will do any good. He is in a gap contract and every one of our players has signed a gap contract. "You look at the football players who are making minimum wage, they get paid after they go through that time. I find it frustrating that some teams are in a hurry to sign these guys to big contracts. I think it's because the owners or managers panic and it's unfortunate that he has listened to his agent and decided [to do] that." It is likely Stepan will have to compromise a bit more in order to get this done. But the Rangers are going to have to be willing to compromise, too, and come closer to the asking price of $3.5M per than they have been willing. If they don’t, Stepan will have a serious problem. But then, so will the Rangers. It’s lose-lose. The team needs him every bit as much as he needs the team. Leverage is one thing. Losing games in a stubborn attempt to exercise it is something else altogether. The gap isn’t that significant. It’s time to get this done. Cody Hodgson re-upped last Wednesday with the Buffalo Sabres, there remain just a handful of unsigned players out there as NHL training camps opened with the first on-ice workouts Thursday. Derek Stepan hasn’t come to terms with the New York Rangers. Also, the Leafs and Ottawa Senators are negotiating hard with Cody Franson and Jared Cowan, respectively, and the St. Louis Blues appear headed toward a showdown with their best player, Alex Pietrangelo. But that’s it. Compare that to how things were in the 1990s, when it seemed every team had two or three annual contract skirmishes. New York Rangers center Derek Stepan, an unsigned restricted free agent, missed his second straight day of training camp Thursday, and a resolution to his contract situation does not appear imminent. Rangers general manager Glen Sather said he has been in constant communication with Stepan's camp but that there is nothing to report. Sather said Stepan has to understand the parameters and limitations that come with the salary cap in the new collective bargaining agreement. As of now, Sather said Stepan seems open to the team's standard two-year "bridge deal" but that the sides remain "too far apart" on dollars to make a deal. What Is Derek Stepan Worth To The New York Rangers? Stepan is believed seeking a five- or six-year deal in the neighborhood of $5 million per while the Rangers are believed offering a two-year contract worth between $2.75-and-$3 million a year. Stepan’s request is not at all outlandish given his work the first three seasons of his career during which he clearly outperformed an extremely club-friendly Entry Level contract worth $875,000 per year. The fact is Stepan, a 2008 second-round (51st overall) draft selection who emerged as the Rangers’ first-line center in 2011-12 and 2012-13, was eighth in scoring in the NHL among players 23 or younger over the last three years with 140 points (56 goals, 84 assists). That’s more than Matt Duchene (138), Evander Kane (133), Jeff Skinner (131) and Sam Gagner (127). But it is also a fact Stepan, who did not have arbitration rights coming out of Entry Level, has no systemic negotiating leverage in this negotiation with the Rangers beyond withholding his services — unless, that is, he is able to attract a Group II offer sheet that would prove debilitating to the cap-squeezed Blueshirts. One of the few question marks surrounding the Rangers before training camp opens is the status of restricted free-agent Derek Stepan. Assistant general manager Jeff Gorton said he expects a deal to get done with the 23-year-old, but added the Rangers aren’t willing to break the bank to do it — especially with the salary cap being reduced this season. “I think there’s always a way to make a deal,” Gorton said Thursday. Green is questionable to return and no penalty on the play. ***Cheers to Derek Stepan of the New York Rangers, who burst onto the NHL scene last night with a hat trick in his first career game. Dallas’ Fabian Brunnstrom was the last player to manage three goals in his NHL debut and Stepan became the fourth player in league history to accomplish the feat. That it came against the reigning Vezina Trophy winner in Buffalo’s Ryan Miller, too, makes the performance that much more impressive. If Stepan’s contributions in the early-going are any indicator, New York will fare far better than some of us may have predicted. 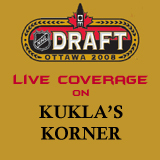 Guest writer Erin Nicks is covering the NHL Entry Draft in Ottawa for Kukla’s Korner this weekend. Those concerned about Ottawa picking up some grit in this year’s draft will need to dig deep into Round 5, when the club (after much apparent hemming and hawing) selected defenceman Mark Borowiecki with the 139th pick.